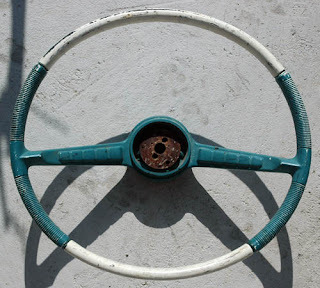 If you're working on an old car, you're likely at one time or another to come up against a steering wheel from hell. One that looks like the bad boy above (this particular vision in plastic was looted from from a '61 Studebaker Lark 4-door. The rest of the car looked worse). So what do you do with a beast like this? Paint is easy enough, but what about the cracks? Several companies make kits to restore steering wheels (like this one from Eastwood), and some companies will re-cast your wheel -- they break off all the old plastic and mold new plastic onto the wire frame. Schrock Brothers are one such company well-known in the Studebaker world. But most of us don't need a re-cast wheel and are willing to take on the process ourselves. But even though the kits you can buy are well-documented with detailed instructions, there's a bit of trepidation involved in breaking out the tools and cutting into your wheel, no matter how unlovely it is. Tool Dude Tony, also known as Dudorino on the SDC Forum, has posted a YouTube video showing just how easy it is to do this job yourself; he illustrates on the wheel from his own '57 Hawk (seen in the vid). All you need are a few common tools, some two-part epoxy, and a little time, and you can have that wheel back in presentable shape in no time. It's been noted in this Forum thread that the POR epoxy that Tony uses in the vid is suitable only for hard plastic wheels, as it cures rock-solid. If you have one of the flexible wheels, 3M #8081 Panel Adhesive is recommended as a filler, as it solidifies but does not harden. Now there's no excuse for that lousy cracked wheel! Git 'er done!